ANTARCTIC QRP TROPHY – W.A.P. 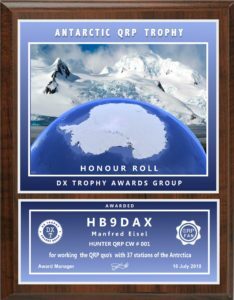 DX TROPHY AWARDS GROUP issues a Trophy called “ANTARCTIC QRP TROPHY” which is given for QSO’s with Antarctica for QRP QSO report marked on QSL. Plaque made on a glossy silver, size 250 x 200 mm.